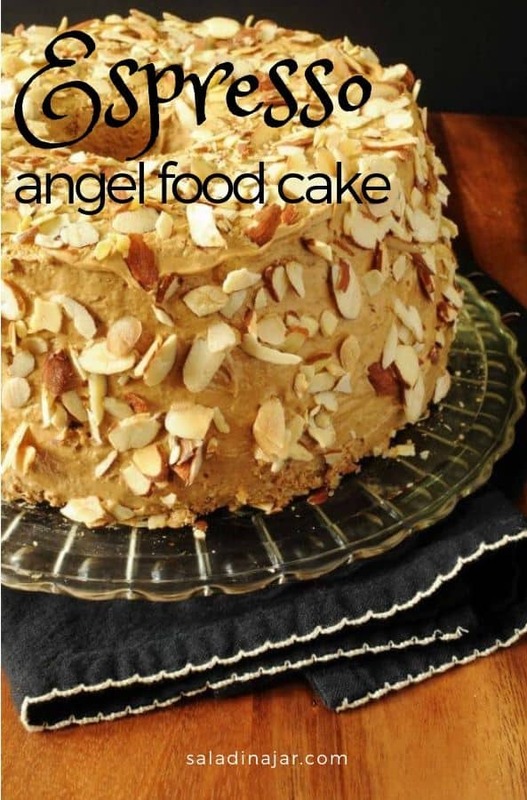 Espresso Angel Food Cake goes the easy route with a cake mix flavored with instant espresso. Slather the cake with a rich espresso-flavored icing, then randomly distribute toasted sliced almonds. Decadent! This cake is my adaptation of Helen Corbitt’s Coffee Angel Food Cake once (and maybe still, I’m not sure) sold at Neiman-Marcus. Believe it or not, my first job out of college was in the Men’s Furnishings department at the downtown Dallas Neiman-Marcus store. I was “forced” to walk by the snack bar every day and drool. However, now I can make it myself, and you can, too. 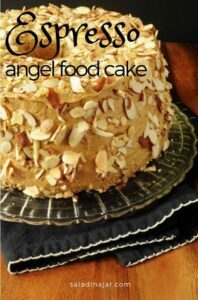 Why a cake mix in Espresso Angel Food Cake instead of a scratch recipe? My answer is another question. What item in your house do you save, but then end up throwing out later when it gets too old because you never did use it? For me, it’s egg whites. I always plan to bake an angel food cake with those egg whites, but for some reason, I don’t. Meanwhile, I move those frozen egg whites around in my crowded freezer for awhile and eventually throw them out. That’s why I end up using a cake mix. As it turns out, angel food cake mixes always rise higher than my scratch cakes and is quite tasty. Adding flavoring, such as instant espresso, improves them considerably. A thin layer of rich espresso-flavored butter creme frosting on this light-as-a-feather fat-free cake makes an impressive dessert. Almonds (toasted in the microwave if you like) are the finishing touch. 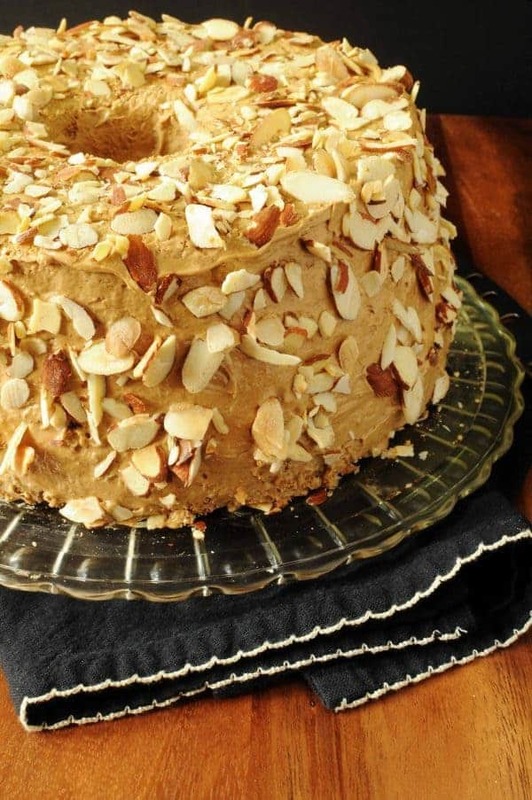 Espresso-flavored angel food cake is covered with espresso-flavored icing and studded with toasted almonds. 1 tablespoon instant espresso added to water called for in cake mix. Follow directions on package, adding instant espresso to water before adding water to dry cake mix. Continue mixing and bake as directed. Allow to cool completely and remove from pan. Whip butter until light and fluffy. Add powdered sugar and mix well. Add milk and espresso. Continue to mix, adding milk if necessary for easily spreadable consistency. 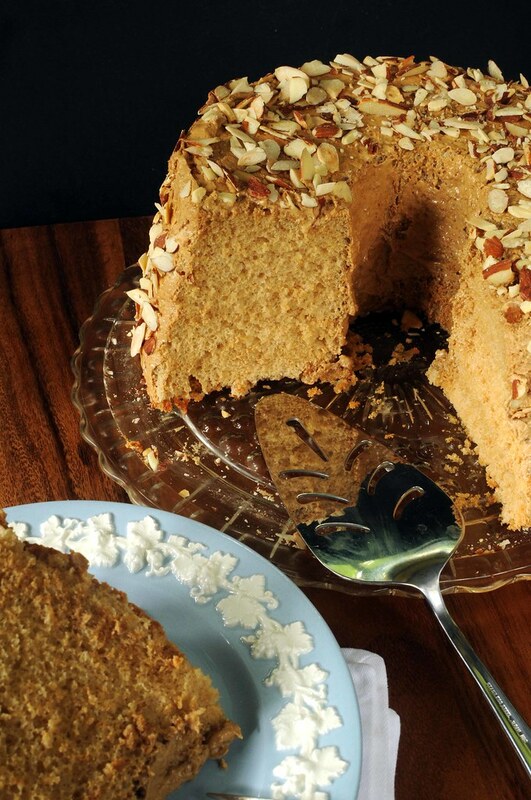 Cover cake with toasted sliced almonds. Would you refrigerate this cake? I grew up eating this cake. First from Neiman’s and then my mom made it. Thank you for posting the recipe! This looks fabulous, I will add this to my recipes! This looks like a light and delicious summer cake. Nicely done! 2 of my favorites! Well, the 87 frozen egg whites are always on hand, but I have my cappuccino every morning and keep at least 2 jars of instant espresso in the pantry. LOVE this combo – I will be making the cake though (prod prod) – I need to use up those whites. I also love your cake plate – is that depression glass??? Looks so yummy and it has to be more heatlhy than most cakes. Now to substitute that butter… hmmm! Maybe skim milk for the milk in the icing? Makes me want to eat an angel food cake again! Yes, you could definitely substitute skim milk. I guess you could also cut back on the butter…but I would rather eat a smaller piece or do a few extra jumping jacks. OMG Romaine, that looks fantastic! Bookmarked! Egg whites are more easily stored in the freezer if you first freeze them individually in an ice cube tray before transferring to a zip-top bag. This way, you can use them one at a time if needed, and they thaw quite fast. As a “caker,” I do this all the time because there’s always one cake that will use only yolks (or some yolks and some whole), and another that will need just the whites. I have read this idea before but never tried it. Makes sense and addresses perfectly my problem. When I put all the egg whites in a jar to freeze, they are too difficult to use. This is the perfect solution. Thanks for taking the time to comment. Your Espresso Angel Food Cake look beautiful and I know it taste amazing. Would it taste (just wrong) to make it with Folgers instant coffee? I don’t drink coffee so the only thing in the house is my mothers instant Folgers. I know Espresso has a taste of it’s own. Please advise. Sandy, the instant coffee should work just fine. This looks really delicious! 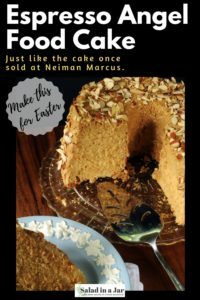 I’ve never attempted an angel food cake from scratch, but I like the boxed mix. This would be a great way to dress it up, and espresso with the sweet cake sounds wonderful. I regularly eat yogurt with espresso powder mixed in thanks to your tip!